Today I am hopping with Laura over at Laura's Loft for the Trick or Treat Shop & Hop. We have some wonderful talent gathered today and I am sure you will love what they have created. Laura is also having a Trick or Treat Giveaway details at the bottom! Today I am featuring a couple of the wonderful items that can be purchased through Laura's Shop. I have to say I am so excited to be a guest designer this month. I am featuring a Newton's Nook stamp set, along with the WRMK Fuse Tool. When I began this project two weeks ago I was working on a card, and then decided to change gears wanted to do a shaker but not a card, so let me tell you about my Shaker Bookmark. I began with Neenah bright white 65lbs card stock and cut it to 3.25" x 5.25". 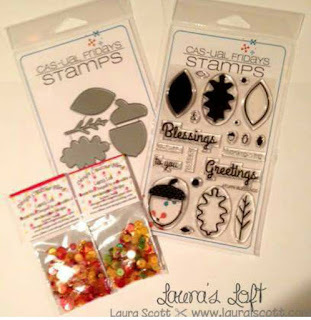 I then used my Sizzix Big Shot and the WRMK Woven embossing folder (coming soon to Laura's Loft). Then I had some inky fun and used Spiced Marmalade and Squeezed Lemonade Distress Inks by Ranger. From then I decided to use Homemade Splash Spray in Orange, Green and Gold to get the fall colors going. Once I achieved the appropriate mess in my room, I mean colors I wanted I left it to dry. I then on the same Neenah bright white stamped Newton with sleeping on his pumpkin stack and the wagon from the Wagon Wishes stamp set using VersaColor Black. I then colored with Spectrum Noir Markers and let dry. I then used the scan/cut option with my Silhouette Cameo to cut it out. I then went over the wagon with clear Wink of Stella. 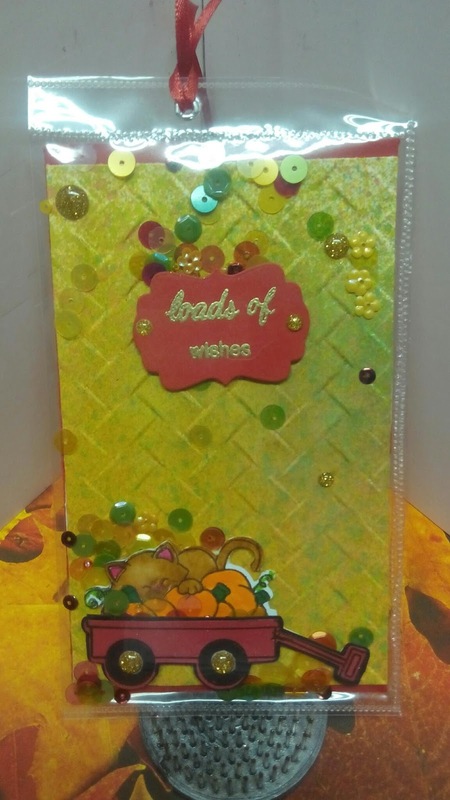 The sentiment "Loads of Wishes" is also from this same "Wagon Wishes" stamp set and heat embossed with Gold embossing powder, cut with a WRMK Quickutz Long Frame die. Once this was all together I mounted it with Tombow Multi Adhesive on a paper studio red card base. Once I was finished with all this I used a Fuse 4x6 pouch and enclosed the bookmark, added some of the Autumn Serenade sequin mix and Virginia Turtle Enamel Dots, and closed it up. I added an eyelet at the top and slipped in the ribbon. This was a very fun project and I hope you enjoy. I do see more bookmarks being created in the near future for this Mimi. In order to get $10 of of a $75 or more purchase. 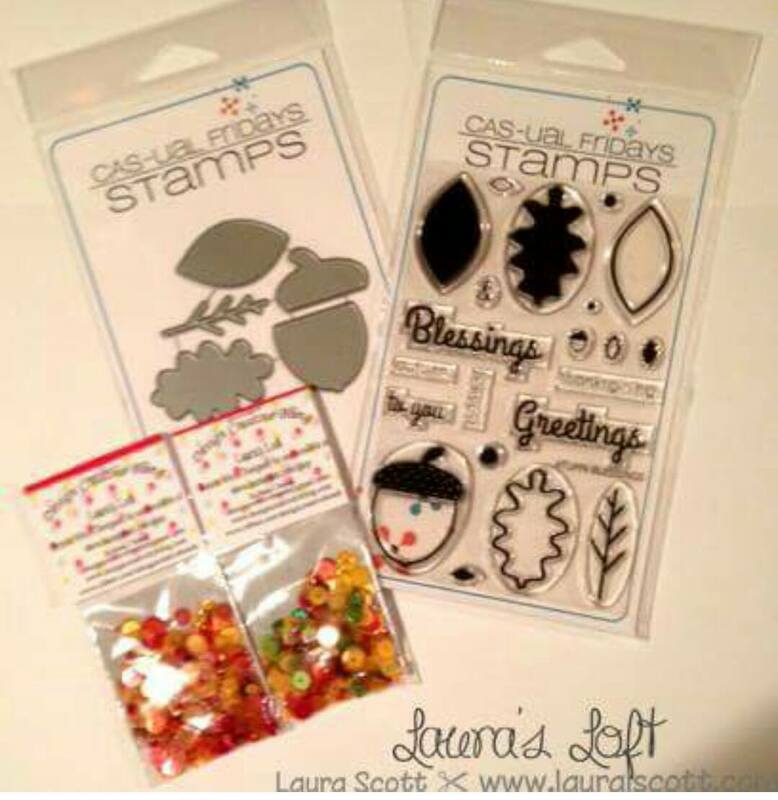 Make sure you enter Laura's Loft Giveaway to win this fantastic Laura's Loft Trick or Treat Hop Stamp, Die and Sequins Mix Set. T&C posted at the bottom of the page. You have reached the end of the hop. Sure has been great hopping along with everyone today. Please make sure you have checked in and commented on the rest of the blogs, and followed those 3 steps above to be entered into the giveaway. Lee Ann...you are a fabulous designer. I love all your work! Have a great day! Love your tag! So fun and who wouldn't love to get it! I love that you stepped out of the box and made a bookmark! Too Cute with that stamp set!